The Global Volcanism Program has no activity reports for Hakusan. The Global Volcanism Program has no Weekly Reports available for Hakusan. The Global Volcanism Program has no Bulletin Reports available for Hakusan. 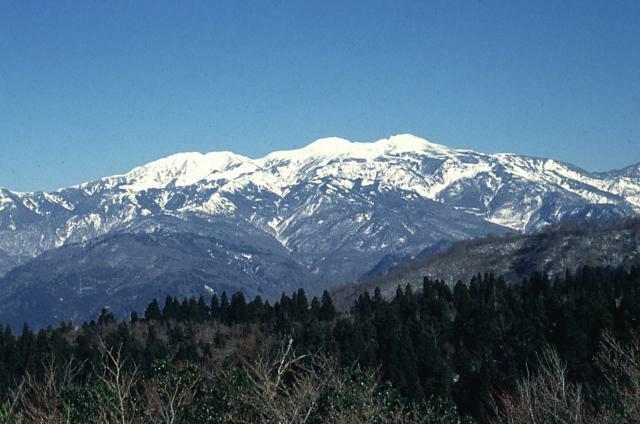 Hakusan, along with Fujisan and Ontakesan, is one of Japan's three most sacred mountains. It is a complex andesitic-dacitic stratovolcano overlooking the Japan Sea. It was constructed over a high basement of sedimentary rocks in a region of very heavy snowfall that has contributed to erosional dissection. Holocene eruptions have consisted of phreatic or phreatomagmatic explosions from several summit craters. Partial collapse of the summit produced a debris avalanche down the E flank during the mid-Holocene. Historical eruptions were recorded over almost a thousand-year period until the 17th century. 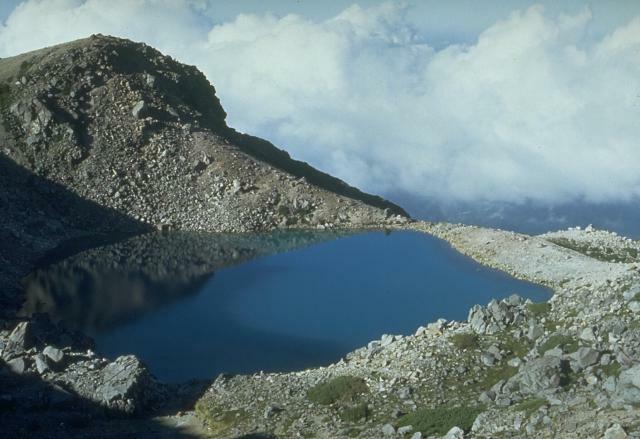 This volcano is located within the Mount Hakusan, a UNESCO Biosphere Reserve property. Endo K, 1985. 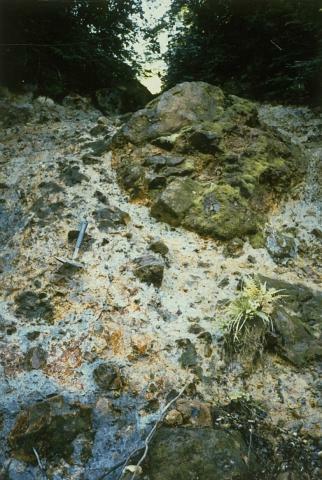 Peat deposits and volcanic ashes on Haku-san volcano. Hakusan Nature Conservation Center, Rpt of Sci Res on the Alpine Zone of Mt Hakusan, p 11-30 (in Japanese). Higashino T, 1989. The Documented Record of the Historic Activity of Mt. Hakusan. Ishikawa Prefecture: Hakusan Nature Conservation Center, 8 p.
Yamasaki M, Nakanishi N, Kaseno Y, 1964. Nuee ardente deposit of Hakusan volcano. Sci Rpt Kanazawa Univ, 9: 189-201. Yamasaki M, Shimizu S, Moriya I, Togashi S, Endo K, Higashino T, 1988. Evolution of Hakusan volcano, Central Japan, during the last 10000 years and the volcanic disasters in future. Proc Kagoshima Internatl Conf Volc, p 445-447. [ 0853 ] [ Unknown ] Uncertain Hm-14 tephra? There is no Deformation History data available for Hakusan. There is no Emissions History data available for Hakusan. Haku-san, one of Japan's three most sacred mountains, is a complex stratovolcano overlooking the Japan Sea. 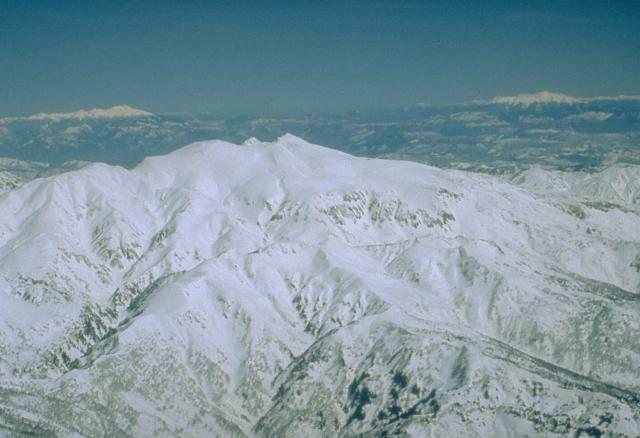 It is seen here from the west, with Norikura and On-take volcanoes forming the high snow-capped peaks on the left and right horizons, respectively. Haku-san was constructed over a high basement of sedimentary rocks in a region of very heavy snowfall that has contributed to its erosional dissection. Historical eruptions were recorded over almost a thousand-year period until the 17th century. Photo by Ishikawa Prefecture (courtesy Toshio Higashino, Haku-san Nature Conservation Center). 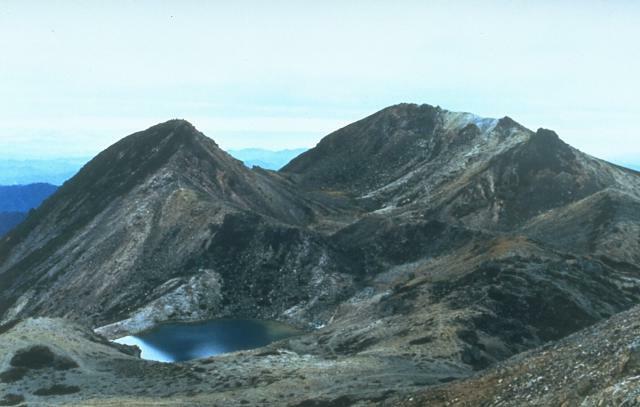 Kengamine (left) and Gozenga-mine (right) peaks are seen from Onanji-mine, another of the summit peaks of Haku-san volcano. The Kengamine lava dome and the Shiramizutaki lava flow extending from its base originated during an explosive eruption about 2300 years ago. A pond fills the Midorga-ike explosion crater in the left foreground, which was formed during an explosive eruption in 1042 CE. Photo by Toshio Higashino (Haku-san Nature Conservation Center). Midoriga-ike, seen here from the SW, is one of several craters along the summit complex of Haku-san volcano. Old documents contain a story of an eruption in 1042 CE in which Midoriga-ike pond was formed and a wooden hut near the summit was buried in debris. The contemporary descriptions suggest that the eruption consisted of phreatic explosions that ejected older volcanic rocks around the vent. Haku-san ("White Mountain"), seen here from the WNW, is a complex stratovolcano near the Japan Sea coast. Its elongated profile results from eruptions at multiple vents along a roughly N-S line. Holocene eruptions have consisted of phreatic or phreatomagmatic explosions from several summit craters. Partial collapse of the summit produced a debris avalanche down the east flank. Historical eruptions were recorded over almost a thousand-year period until the 17th century. 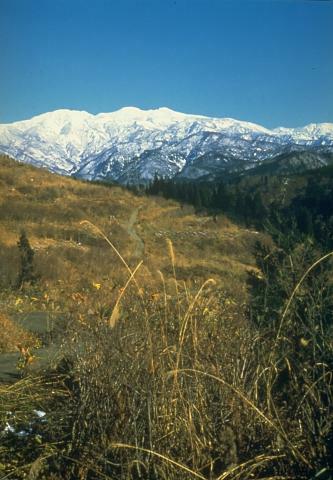 Photo by Ishikawa Prefecture, 1994 (courtesy Toshio Higashino, Haku-san Nature Conservation Center). There are no samples for Hakusan in the Smithsonian's NMNH Department of Mineral Sciences Rock and Ore collection. Large Eruptions of Hakusan Information about large Quaternary eruptions (VEI >= 4) is cataloged in the Large Magnitude Explosive Volcanic Eruptions (LaMEVE) database of the Volcano Global Risk Identification and Analysis Project (VOGRIPA).